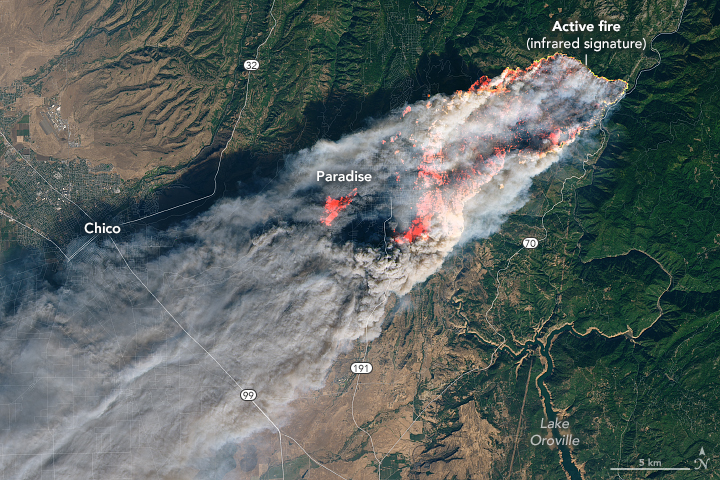 The last two weeks have been a major turnaround for water resources along the west coast of the U.S. And a decided end of California's dry season and enough water to end the wildfire threat over central and northern CA. Here are the precipitation totals for the past two weeks from the National Weather Service official analysis for the western U.S.. Significant totals, ranging from around 15 inches in the northern Cascades to 5-10 inches in the higher terrain of California. 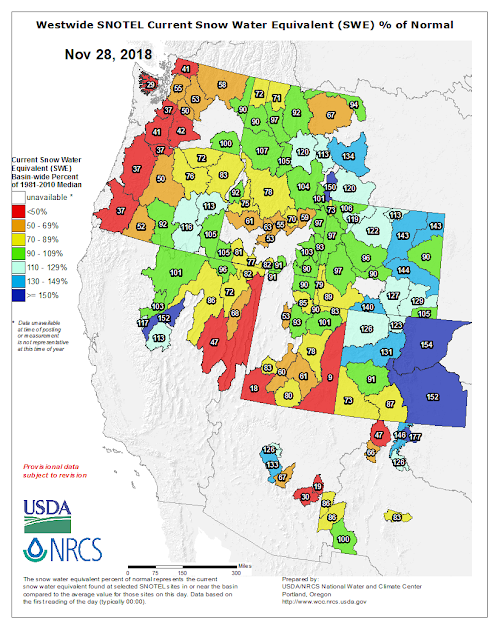 The latest streamflow levels show most of our state has normal to above normal streamflow, with the exception of a few rivers over SW Washington. 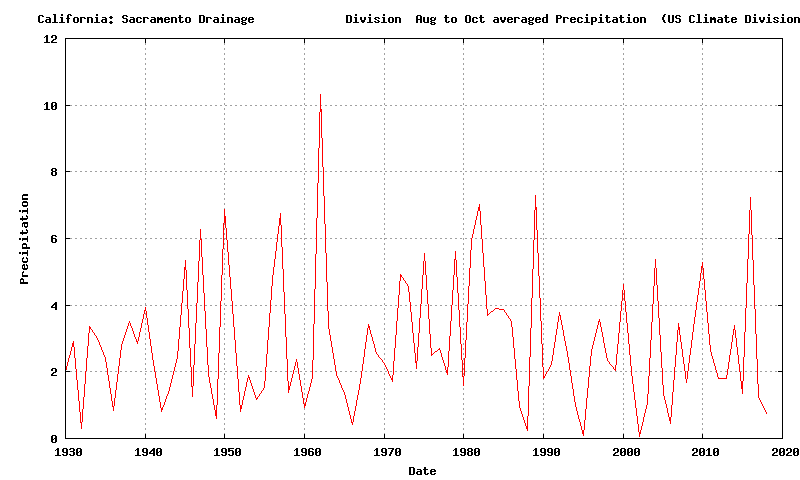 California has normal to above normal streamflows after all the rains. 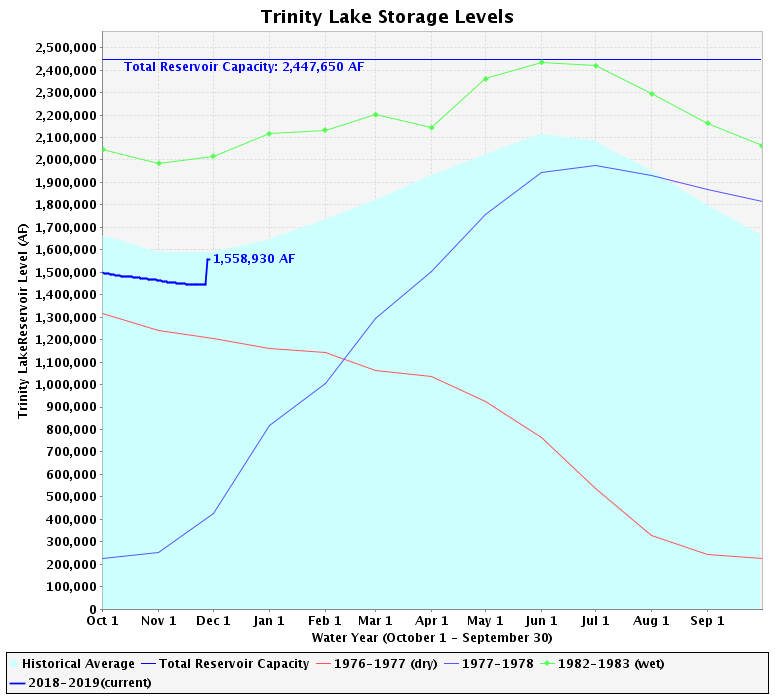 Reservoir storage in California is in good shape, most at or near normal (the red line), except for Lake Orville, the heavily damaged reservoir in which water levels have been held low). 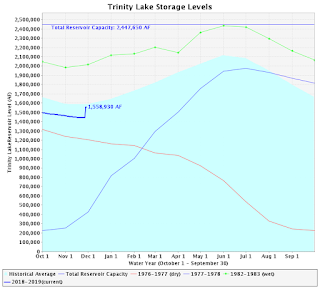 There is plenty of room to store more water, and the recent rains are starting the process. 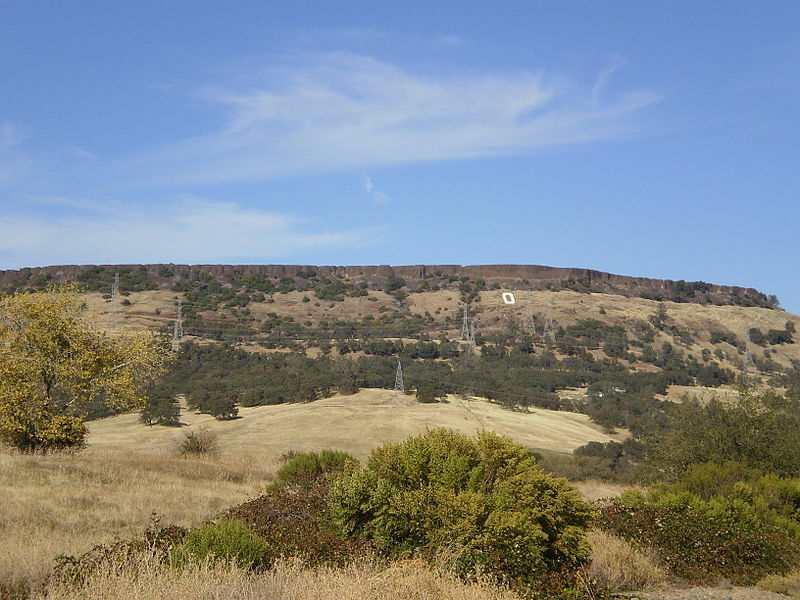 The bottom line is that worries about drought are now fading, as substantial precipitation has reached the west coast of the U.S. There has been a substantial increase in our snowpack during November. To illustrate, here are the snow depths on November 1 and last night. 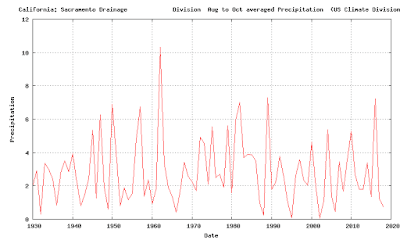 Notable increases, particularly over the north Cascades and southern BC.. But even with increases, the snowpack is less than at the same time last year (see below). In fact, although there have been considerable increases in higher elevation snowpack the past few weeks, the latest USDA Snotel data shows that the Cascades are still below normal (about 40%), while the northern Sierra Nevada is above normal, as are the western slopes of the Rockies. The last day has not been kind to our mountain snowpack, with warm, rainy conditions caused by a moderate atmospheric river. 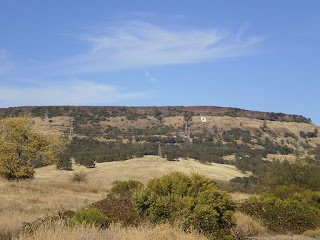 But that is past now and we have been experiencing cooler, unstable conditions, with decent snow showers in the mountains. The forecast for the next 72 hr (ending 4 AM Saturday), suggests another half a foot at higher elevations in the Washington Cascades and huge snow dumps over northern CA and southern Oregon. Now modern ski areas have considerable capabilities for making snow if the temperatures are cold enough, and there is good news on that front--we are heading into a period of much cooler lower atmosphere temperatures. To show this, here are the NOAA/NWS GEFS ensemble air temperature forecasts at the surface for Stampede Pass in the central WA Cascades around 4000 ft (remember that in an ensemble system we run the forecast model many times to explore uncertainty). The black line is the average of the forecasts, the ensemble mean, which is usually a very good forecast. Temperatures really drop the next few days and generally stay below freezing. Any snow won't be melting and snow making should be fine about 3500 ft. Crystal Mountain will reopen on Friday, Baker and Stevens are getting close, and Whistler is open with early season conditions. Enjoy. Strong winds, some exceeding 50 mph, are hitting some parts of the Northwest today. And a moderate atmospheric river promises substantial rain in the mountains. The maximum wind gusts over the past 24 h, shows a fascinating picture of very strong wind in some locations, while lighter winds are evident in others. 45-55 mph gusts in the San Juans and along the coast. 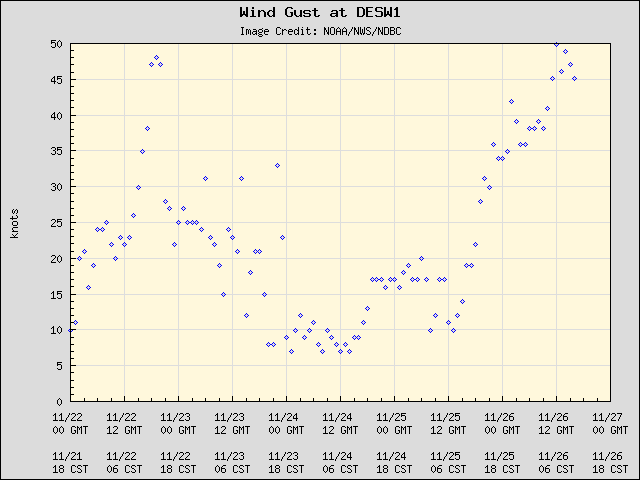 And 40 mph gusts east of North Bend as one ascends towards Snoqualmie Pass. But light winds around Puget Sound. Such huge differences result from our terrain and land-water contrasts. A forecast from the UW WRF modeling system of sustained winds (not gusts) for 10 AM this morning shows the pattern (see below). In particular, look at the strong winds from the eastern Strait of Juan de Fuca across the San Juans. Why are they there? Blame the Olympic Mountains! The sea level pressure forecast is shown by the light brown lines. There is relatively high pressure on the windward (south side) of the Olympics and a leeside pressure trough on the northern side. This pressure pressure pattern results in a strong pressure difference on the northeast side of the Olympics that accelerates the winds from the southeast. And strong winds are found on the western side of Snoqualmie Pass because there is a large pressure difference across the Cascades and air is accelerating towards lower pressure to the west. 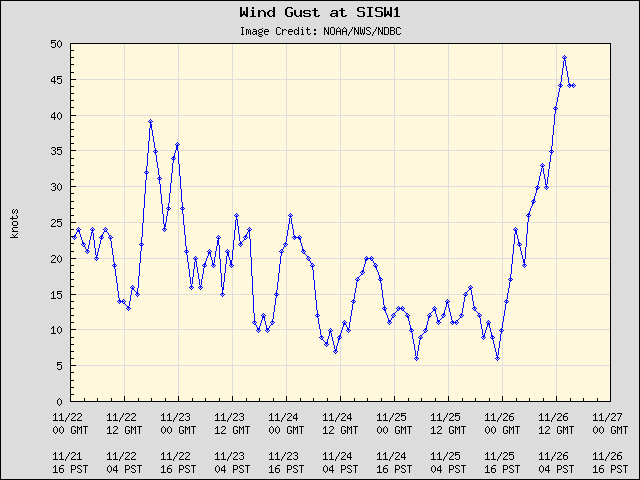 Smith Island, just west of Whidbey Island, has had recent gusts to 48 knots (SISW1) and similar winds are being experienced along the coast, such as at Destruction Island (DESW1). Destruction winds are particularly vicious because of the Olympics as well, since the barrier enhances the pressure gradients in the area. But winds are only part of the story today. A moist flow, known as an atmospheric river, is heading right into us, as shown by the infrared satellite image at 7:30 AM (below). A really juicy frontal cloud band that stretches well into the Pacific. And then mid-week the jet stream goes south and California gets hit hard by precipitation and mountain snows. 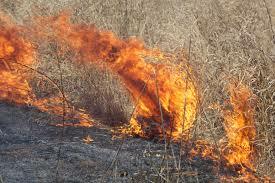 Fire season is over for central and northern CA. I will be teaching atmospheric sciences 101 during winter quarter at 11:30 AM at UW's Kane Hall. Basic introduction to atmospheric sciences, with a 10 minute "weather discussion" starting every class. Yesterday, a bus with a number of students of the Husky Band overturned on Interstate 90 just west of the town of George, Washington (see map below) as they headed to the Apple Cup game in Pullman. A number of students sustained injuries, but thankfully none were life threatening. As I will discuss below, severe icing conditions occurred due to fog, freezing rain, and freezing temperatures, and with modern observing, modeling, and warning technologies, coupled with cautious driving, the number of such events can be greatly reduced. The accident occurred around 5:30 PM Thursday. 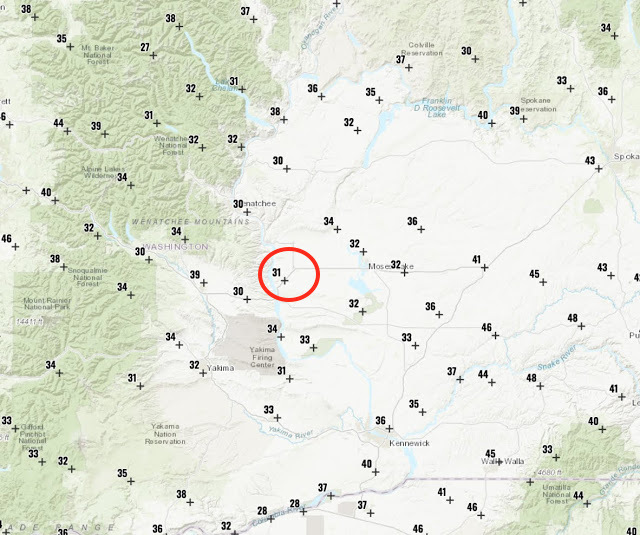 A plot of temperatures at 5 PM (with the accident location indicated by the red circle) shows freezing and below freezing surface air temperatures, with 31F reported in the immediate vicinity, while to the southeast temperatures were in the 40s. A 13-h model forecast of winds and surface air temperature valid at 4 PM was very realistic, showing the threatening cool temperatures over the accident region, while warmer temperatures were predicted over SE Washington. The cool temperatures were accompanied by low clouds and fog, something shown by a high resolution visible satellite image around 1 PM (see below). 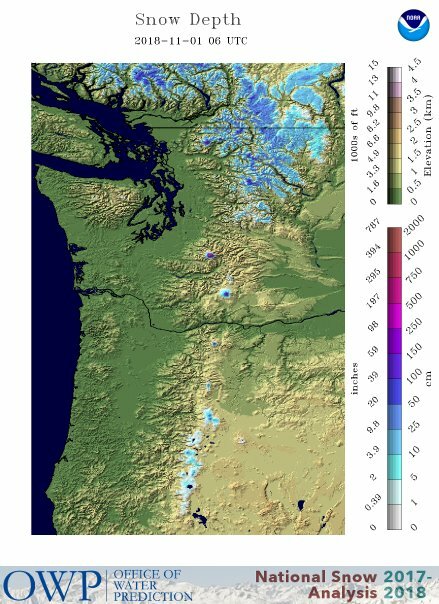 Freezing rain is rare over western WA, except near the outlets of the Columbia Gorge and Fraser River Valley (e.g., Bellingham), but often occurs in eastern WA as cool air pools in the Columbia Valley or is pushed on to the eastern slopes and adjacent regions. I have spent a large amount of time studying and working with WSDOT (Washington State Department of Transportation) and SDOT (Seattle Department of Transportation) on the issue of roadway icing. And I have occasionally done some forensic work on roadway icing accidents. Roadway icing is probably the greatest meteorological threat faced by WA State citizens. More than windstorms, flooding, thunderstorms and everything else (I have checked the numbers). One thing I learned: freezing fog can be a huge threat. Fog has lots of water content and when fog droplets contact a cool roadway surface, substantial icing can occur rapidly. When air temperatures are below 35 F and you see fog, you should immediately slow down. Why 35F? Because air temperatures are measured at roughly 6 ft above the surface (car thermometers are at roughly 2 ft above the surface) and surface temperatures can be cooler that air temperatures, particularly at night. The threat of icy roads was already evident that morning with the Grant County Sheriff reported icy roads. But unfortunately, Washington State efforts are beginning to slide and new technologies that would promote roadway safety are not moving forward. 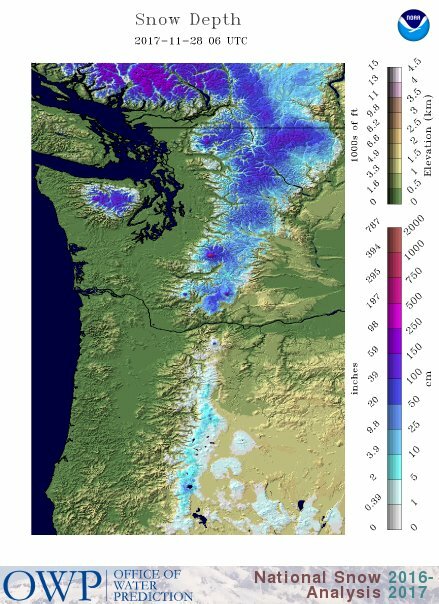 Recently I learned that Washington DOT (WSDOT) is going to cut all funding to the roadway weather pages and data streams produced by the UW (e.g., I-90, SR-20, I-5, Ferry Weather), substantially cutting back the information available to the public. Just as serious, we are not moving forward with protective warning technologies that could produce timely warnings of dangerous road condition for WSDOT personnel and the motoring public. Today, there are immense amounts of information describing, in real-time, weather and surface conditions around the State. Thousands of surface stations, weather radar information, amazing new weather satellite capabilities, smartphone pressures, to name only a few. Plus, high resolution weather modeling has improved rapidly, with new rapid-fresh forecasts being made every hour. And soon cars and trucks will serve as massive data sources. This huge potential is magnified by the fact that most folks have smartphones, and thus we could provide real-time, vehicle specific warnings of threats on the roads ahead. I believe we can stop many of the fatal/injuring accidents caused by snow and ice on the roadway, such as the tragic accident of a pregnant woman on I-90 last year. Unfortunately, the Washington State transportation bureaucracy is not pushing forward on such technological advances, with the explanation that WSDOT lacks the funds to do so. Hopefully that will change someday. The effective use of weather information, coupled with smartphone distribution of warnings, has the potential to save many lives and to substantially lessen weather-related carnage on our roads. A band of moderate rain is now moving through western Washington, but the good news is that it will clear the region by 3 AM Thursday. There will be a period of dry conditions from roughly 4 AM to 1 PM around Puget Sound, so if you want to get your Thanksgiving walk or run in, this will be the time. The 3-h precipitation totals ending at 7 AM shows dry conditions over the western lowlands (and a few showers over the mountains). A juicy band of precipitation is offshore. The next three hour totals (ending 10 AM), show the frontal band making landfall. And the 3-h rainfall ending 1 PM shows the wet stuff over Portland and just reaching Seattle. The following several days will be characterized by lots of showers. The 72h total ending 4 PM Saturday has up to 2-5 inches over WA terrain and 5-10 inches over some portions of northern CA. But what really has me excited is the snow. We will have cool, showery weather, with a low snow level. Over the next 72 h, 1-2 feet will fall above 4000 ft. Cross country skiing will be possible by Sunday. The precipitation totals over northern California so far in this storm have been moderate, with around 1.25 inches in the mountains behind Paradise, CA and a few locations getting 2-3 inches. A lot more is coming. The good news is that the California-Nevada River Forecast Center indicates little chance of flooding over California (since the ground is starting out so dry) and air quality has rapidly and profoundly improved over much of the Golden State. To show this, here are the latest Air Quality Index values: many are green, indicating healthful air. So enjoy the return to normal weather and wonderful sound of rain on the roof and trees.